There is no mention of a church in Domesday Book. 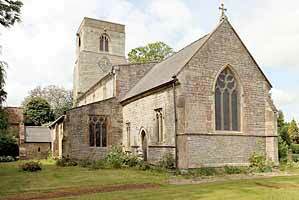 The present church comprises a chancel, nave with north and south aisles, a south porch, and a west tower. The north aisle arcade is of the 13th Century, the south aisle later – mainly 14th Century, and above is a 15th Century clerestory. The side walls of the nave may be earlier. The tower dates mainly from the 15th Century. It is in three stages, but the east wall is archaeologically complex and reflects the earlier structure here when the present tower was built, cutting the north wall of the nave. The nave roof contains heavy tie beams, possibly 15th Century, coeval with the clerestory. Stairs and a doorway to the former medieval rood loft remain on the south side of the chancel arch. There are 3 bells, one undated, but by the Seliok family, one from 1784 by Thomas Hedderly II, and a Chesterfield bell by Godfrey Heathcote of c1540. The bellframe is of hybrid form, possibly containing 16th Century work. There was a major restoration in 1879.
and to Dr Chris Brooke for the photographs.